Sensitivity to 1 µV. Ideal for load cells & pressure transducers. DIN rail mounted, digitally programmable. Includes two relays for alarm or control. 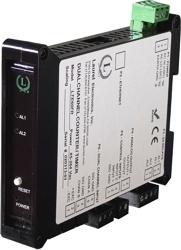 The Laureate load cell or microvolt input transmitter is designed for use with load cells, strain gauges and microvolt input signals where exceptional sensitivity and stability are required. A most sensitive full-scale input range ±20 mV can be scaled internally to ±99,999 counts. The selected input range for the full 0-20 mA output span can be as wide as ±99,999 counts or as narrow as 150 counts, limited only by considerations of electrical noise and time constants of the programmable moving average digital filter. The unit's serial data output is accurate to ±0.01% of reading ±2 counts in ratiometric load cell mode and ±0.01% of full scale in ±2 counts in absolute microvolt meter mode. A built-in, isolated, 10V, 120 mA excitation supply can power up to four 350-ohm load cells in parallel. Load cell connection can be via 4 or 6 wires. With 4-wire load connection, the transmitter operates in a ratiometric mode to eliminate errors due to power supply variations. With 6-wire load connection, it also compensates for lead resistance, allowing long cable runs. Digital signal filtering modes are selectable for stable readings in electrically noisy environments. An unfiltered selection provides true peak and valley readings and aids in control applications. A batch average filter selection averages each 16 conversions for an update every 1/4 sec. An adaptive moving average filter selection provides a choice of 8 time constants from 80 ms to 9.6 s. When a significant change in signal level occurs, the filter adapts by briefly switching to the shortest time to follow the change, then reverts back to its selected time constant. An Auto setting selects the time constant selection based on signal noise. In 4-wire connection, the excitation and sense lines are tied together. The transmitter can make ratiometric corrections for supply voltage variations, but does not compensate for variations in lead resistance. This connection is often used with short cable runs. In 6-wire connection, the sense lines are separate from the excitation lines, thereby eliminating effects due to variations in lead resistance. This allows long cable runs in outdoor environments with temperature extremes. For large scales, up to four 350 ohm load cells can be powered by a single Laureate, whose excitation output is rated 120 mA at 10V. The excitation and sense points of the four bridges are connected in parallel. The load cell outputs will be averaged if the load cells have the same sensititivity in mV/V. ±0.01% of full scale ± 2 counts in absolute mode. WM1 Load cells (4 or 6-wire, ratiometric). Custom scaling.